Stop hunting forex is obviously the most dreadful and the least understood event that beginner retail traders fall victim to. There are also numerous conspiracy theories surrounding this market occurrence. That is why I felt obligated to write about the subject and explain few nuances of this regular market phenomenon. You’ll see this topic being discussed in Fx communities by novice traders a lot. However, not many of them understand what’s really going on when this type of price action occurs on a daily basis. First of all, we need to find out who is hunting our stop-loss orders…is it a broker?…is it a market-maker?…or, maybe, some other mysterious force? Who is gunning for your orders and most importantly – why?! The stop hunting refers to an event, in time, when a lot of traders’ limit orders are triggered. In most cases these are the stop-loss orders. 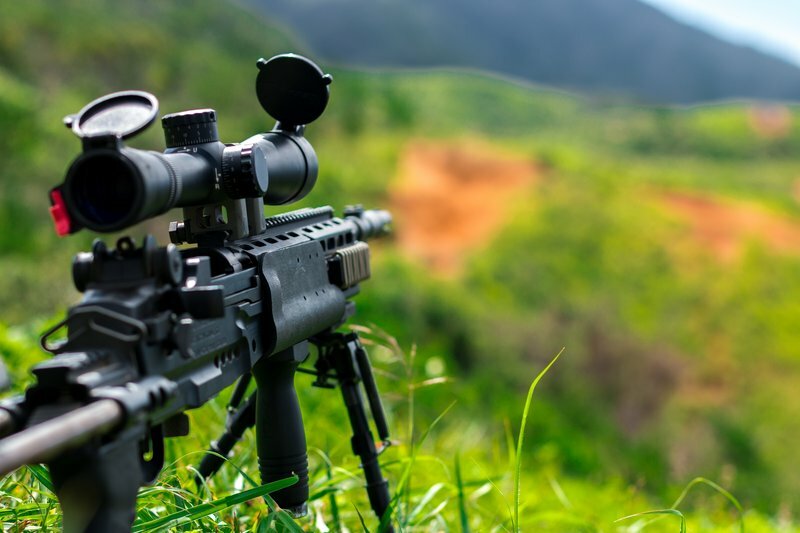 When a speculator is holding a position long, or short, doesn’t really matter, stop hunting happens when the majority of these stop-loss orders are executed. Soon after this, the trade direction changes and price action moves in the opposite way. 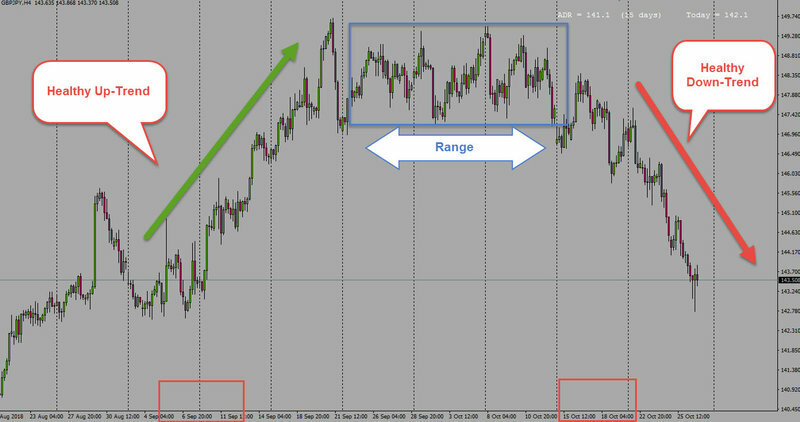 How Does The Stop Hunting Forex Work? This is a typical scenario for the majority of the time, especially if you’re day-trading the Forex market. You’ve scanned the charts, you’ve seen a good trading opportunity, you’ve opened a trade, you’ve defined your stop-loss and the profit target. Then, you sitting and waiting for the market to go your way and eventually hit the profit target. You feel confident, because you’ve done your homework; did multiple time-frame analysis, picked the right currency pair, picked the right direction, chosen the right levels, defined good profit target. Basically, you’ve done everything you could to justify the trade. All of a sudden, the market goes to your stop-loss, knocks you out of the position and continues to move in your original direction! Now, tell me guys and gals, this have happened to you at least few times?! It has happened to me on so many occasions that it made me literally paranoid. I thought, the whole world was against me and didn’t want to succeed in trading. On the picture above the yellow circles represent the actual stop-hunts. The letters represent the areas where the liquidity was heavily concentrated. As you may have noticed, these are the major swing highs and swing lows. Thus, it is safe to assume that above and below the major swing highs/lows, there are pockets of orders – pockets of liquidity. Also, notice how after every stop-hunt the price action goes the opposite way. Who Is Hunting Your Stops? The common prevailing idea is that stop hunting forex occurs because of the Broker. Another argument is that these are Institutional market-makers who are gunning for the stops. The truth is, it’s both. To be more specific, it was both. The reason I say it was, because brokers really did this technique against their clients, not so long ago. A Broker could push an artificial price feed to your mt4 terminal and hit the stop-loss, to get your money. Now it is a new age, the age of STP & ECN brokerages and there is no necessity in stop-loss hunting. First of all, a Broker can lose their license if they’re caught doing these dirty practices and soon they will be out of business. It’s very easy to compare your data feed with another broker’s data feed, and see the discrepancy between the prices. Secondly, if a Broker is still doing this dirty practice, sooner, or later it will be caught in a very disadvantageous arbitrage trade. Meaning, an artificial price feed will create an arbitrage opportunity against itself, and the broker won’t be able to hedge its exposure fast enough. It is suffice to say, nowadays, most of the brokers have changed their trading engines along with the policies, and they need their clients actually to make money. But, a few years ago, it was a different situation. Ok, so if it’s not a Broker hunting our stops, then the other culprit is – an Institutional Market Maker! It is known as someone who has the ability and the resources to move the Market. We are talking about the major banks from the Interbank level. These are major Interbank institutions that serve the Investment corporations; Commercial organizations; Hedge Funds and the whole plethora of high net-worth private individuals. The same banks that provide liquidity to the above mentioned STP/ECN brokers. Now, let’s be clear on one thing – Trends are created by the Institutional order flow, no doubt about that! Nevertheless, those orders go through the market-maker bank. Why does the Stop Hunting Forex occur? Forex stop hunting can take place for several reasons and throughout different times of the trading day. For example, it can happen during news events to shake out early participants. In such events, the liquidity dries up, because everybody is on the sidelines waiting for the release. Hence, the market can be easily manipulated, moved around. The spreads tend to widen and as a result the stops of an early participants, the ones that put the orders before the news, are being triggered. Stop hunting forex also, and most certainly, happens during the market accumulation phases. During this period market just chops around in a sideway motion. Basically, market locks everybody in a range-bound channel and trades from the top side of the channel back to the low side. Many traders usually put their stops above, or below the channel (range) not giving enough room for the trade to breathe, so to speak. In the end, their stops are taken out and the market goes its way without their participation. I’ve seen accumulation phases as small as few dozen of pips, and as big as few hundred. What this all means, for the most part the stop hunting forex occurs, because of Liquidity, or should I say, the hunt for the liquidity. We may refer to the liquidity as an ability of any given asset to be exchanged to cash at a fair market price. Ability, to be bought and sold without any obstacles or interruptions. Liquidity shows the amount and relative frequency the investment is bought, or sold. Thus, the less liquid something is, the harder it is to exchange. A marketplace that is composed of many speculators and has many trades is considered to be a liquid market. You see, we as retail traders do not trade at a size big enough to affect the price. When placing or exiting a trade we never have to think about the liquidity, or fills, or slippage. For the large Institutions though, getting in and out of their positions can be a big problem, because the trades that they place are so large. One of the primary goals of an Institutional trader is to place a trade in the market with as little impact on the price as possible. Which, essentially means finding places (liquid-zones) in the marketplace where a lot of liquidity exist. The majority of the time, pockets of liquidity likely to be found at places where speculators put their stop losses on existing positions, or their new pending buy/sell limit and buy/sell stop orders. Stop losses, being what they are – pending orders on the existing positions, and fresh buy/sell pending orders, are the key in understanding why Institutional traders enter or exit the market at specific areas. Honestly, there is not much we actually can do to avoid the stop hunts. It is a part of the trading business. However, the methods below should help you to minimize their negative effects. It is a very simple and a very easy to use entry technique. However, the method requires some effort and discipline on the trader’s part. The whole concept is this, every time you want to enter a trade from the area that you think is the best entry point, just pause for a second. Take a deep breath, do not execute the trade right away. Quickly adjust your entry point by moving it to the level where your initial stop would have been if you were to execute your original entry. Sneaky, huh…Basically, you are moving your entry to the level of the initial stop. For example, let’s say, you want to enter a long trade. You want to by the market at 1.2550 level, and your stop is 35 pips below at 1.2515. In our case, you do not enter at 1.2550 level, but you place a buy-limit order at 1.2515 level and your stop will be 35 lower at 1.2480 level. You entering trades from the level of your stop. Your stop level becomes the entry point. As you may have noticed, you are playing sort of mind-game with yourself. You’re tricking your impulsive self to avoid the herd entries. This will force you to enter the market with limit orders. It will eliminate the “itchy-finger” syndrome, where you just clicking the mouse and opening trades with market orders. The downside of this technique, you will be trading less, because not all of your trades will be triggered. The upside, while others are going to be stopped out, you will be entering the market from a very advantageous place. More often, than not, market will go to your limit order and trigger the trade. ATR, or the Average True Range is an indicator that was designed to help traders in reading the Volatility. As the volatility increases, or decreases, so does the value of the Average True Range. It is not, I repeat, it is not a directional indicator. The default setting is 14, it calculates the 14 period readings and this means, it can be used on any timeframe. It can be used on longer term charts (monthly, weekly, daily) as well as, shorter timeframes (hourly, 15 min, and etc…). Now, there is no hard rule about how exactly to use the ATR stops. The rule of thumb is, if you want to be on the safe side, use two times the ATR reading as your stop level. 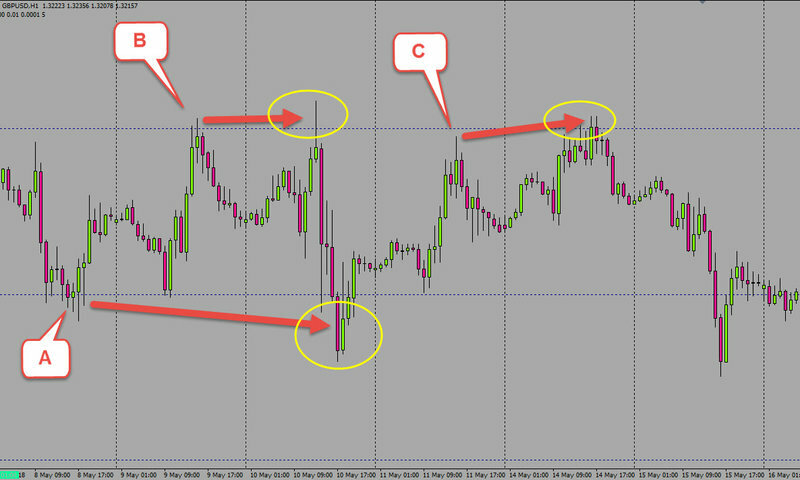 Meaning, traders can set their stops at multiples of the ATR reading. For example, if you trade the hourly (H-1 timeframe) and the current ATR reading is 22 pips, then you might choose to set your stop 2 X 22 = 44 pips. If the stop level seems as if it is too close to the current market price, you can adjust the stop in being more conservative, or aggressive according to your trading style. You can use ATR stops, sort of, as a buffer to avoid getting stopped out by the market noise. As a side note, the ATR stops are best used in trending environment and on a longer timeframes: H-4; Daily; Weekly. Strong trends usually have shallow pullbacks so, when you put a protective stop on a Daily timeframe twice the ATR reading, the chance of being prematurely stopped by the market noise, or by the market-maker becomes very slim. This is another a very simple and a very mechanical stop placement approach. It requires the use of Fibonacci retracement tool. Works best on longer timeframes, you’ll see why in a minute. We all know that price doesn’t move in a straight line, it goes up, retraces, then up again and so on. The same is true for a downtrend, goes down, retraces back up, then continues to the downside. Even in a non-trending environment, in a range bound condition, price still creates these wavy-type price swings. Basically, price moves in an impulse-correction, impulse-correction manner. Now, this is when the Fibonacci retracement levels come in handy, particularly we are interested in 61.8 and 76.4 levels. These levels will be used to place our stop-loss orders. Meaning, you are going to place your stops in between the 61.8 and 76.4 level. Every time you enter the market, plot the fib retracement tool on the chart and place your stops below the 61.8 level, preferably not exceeding the 76.4 retracement. The 76.4 level would be “the point of no return.” This is where we admit that we are probably wrong on our direction. Perhaps, you may wonder why I have chosen the 61.8 level and not the 50, or even 76.4 level as a reference point. Well, the 61.8 retracement level is regarded as a maximum pull-back spot in a healthy impulse up, or down wave. This is the location where collective fear reaches its peak as the short-term speculators are getting tired and decide to bail out of their positions. Meanwhile, the bargain hunters are stepping in at this area and scooping their positions in order to resume the initial impulse wave. The green areas are the entry zones typically coinciding with 38.2 and 50.0 percent retracement levels. The red areas are the stop placement zones – 61.8 and 76.4 levels. 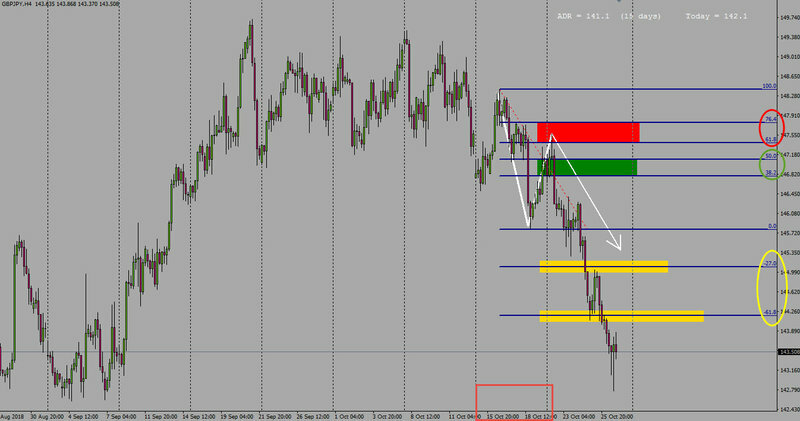 The yellow rectangles are the Fibonacci take profit extension levels – 27.0 and 61.8 levels. Again, you may ask yourself why not just join the bargain hunters and simply enter the market at this level, instead of putting the stops? And the answer is, the 61.8 level is considered to be a deeper retracement, not all the time price goes there to accommodate bargain hunters. Usually, in a typical impulse wave you have market correction that goes to 38.2 and 50 levels. This means, even if you enter the market at a worse possible place, at a peak of an impulsive wave, and place your stop below the 61.8 level, the stop-loss will not be triggered, most of the times. 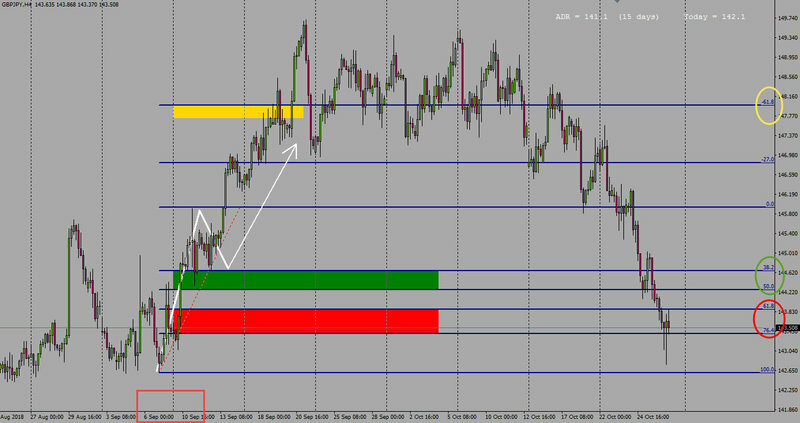 Ideally, you enter at the 38.2, or 50 percent retracement levels and place your stop below the 61.8 level, not exceeding the 76.4 level. Plotting a Fibonacci tool is somewhat subjective. There could be multiple price swings during a trading session. It is advisable to use the tool on significant price swings. 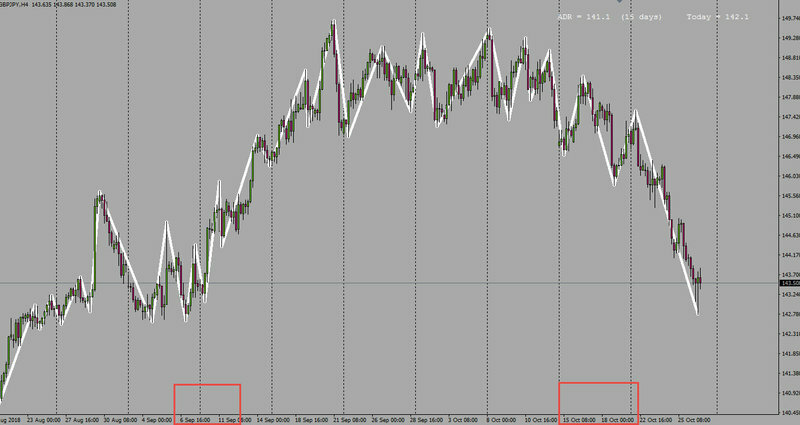 Try to use the retracement tool on significant impulse waves. You may use the ZigZag technical indicator to plot these swings for you. If you are going to use the tool on smaller price moves, then the 61.8 – 76.4 stop placement area will be too close to your entry point. 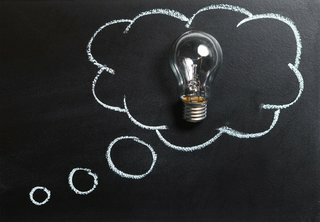 And that is why this technique is most suitable for trading on these timeframes: H-1; H-4 and above. You may hate it, you may not pay attention to it, you may even not bother understanding it, however, the fact remains that given the way the markets operate, stop hunting forex is often a common behavior. Markets seek orders, they seek liquidity. Without new orders price will be at a standstill. Stop loss orders are pending, also known as resting orders, ready to be consumed. For us, the retail traders these are protective orders. However, for the Institutional speculators these are the sources of liquidity. When the Big-Boys initiate their positions, substantial orders need to be filled. So, to fill their orders market-makers need to find liquid areas. In other words, market-makers need to find clusters of stop-orders (liquidity), trigger them and at the same time fill them up with Institutional orders. This is where market-makers fill Institutional positions without giving up their intentions, their directional commitment. This is where and why the majority of retail traders getting stopped out of their positions. Trading Fx in itself is a pretty straightforward business. However, the overall interaction between the various participating groups adds up to a complex affair. The big question is – who is the forex market maker? To answer the question, first we need to understand these players. The group of Fx participants is a big bunch. You see, the Forex market breaks down into a large number of speculators of varying sizes and with very different objectives. You have Intraday traders, Swing traders, Long term Investors. And, if you add the HFT machines with their scalping methodologies into the mix, you can see how this, quickly becomes very complex. At the very top of the Fx pyramid there is an Interbank. This is the level where major financial Institutions are exchanging their currencies. Imagine this being as a wholesale place for buying and selling the currencies. It is here, where we can witness the true power of the forex market maker. Each Bank has a dedicated market-maker that is curating each major currency pair. 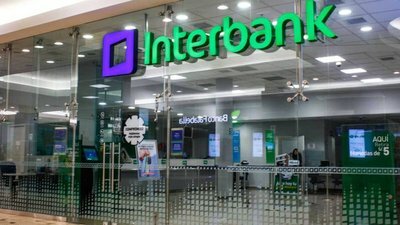 It provides quotes at which the bank is willing to buy and sell currencies from their fellow bank partners in the Interbank network. Therefore, without the shadow of the doubt, we can say that the Institutions that are on the Interbank level are the primary market-makers of the FX arena. One of the sophistications of the Interbank marketplace, and maybe one of the important factors, is the credit relationships that the major banks have among each other. The banks buy and sell currencies between each other with this credit-worthy approach. Not to mention, the deal sizes on the Interbank level are typically very large. Definitely, out of reach of retail trader’s pocket. These combined nuances prevent, or should I say filter, most participants from directly accessing the Interbank market. In essence, the Interbank is self-regulating itself with the above mentioned factors. Indeed, there was a time period, not so long ago, give or take, twenty years ago when the Fx marketplace was strictly the domain of large banking companies and genuinely well established financial Institutions. Thanks to the technological and the data processing revolution, that all has changed! The rise of Retail FX was inevitable. Nowadays, everybody can access the Forex market easily and compete with large banks for the share of Fx profits. This is done through the retail Fx brokers. Usually it is either an ECN, or an STP broker that plays the role of an intermediary between the “average Joe” and the Interbank. Later on we’ll be discussing the difference between the market-makers, but for now let’s focus on the role of the Forex market maker. The primary role of the market-maker is to do what its name implies – to make the market! A market maker sets two-way prices in a certain currency pair in order to make a market. Sets two-way prices (bid/offer) prices in a particular currency pair. Commits to accepting orders at the current market prices. Since the Fx market maker is a counterparty to a trade, it takes the resulting exposure from the order-flow on to their own order-book. What this means, they are not matching the trade with another party in the way that an ECN or an STP broker would. An Interbank market-maker may choose to hedge his exposure with another bank, if he is able to obtain a favorable rate. How much of a risk they decide to take on, or to take off the table, will be at their sole discretion. 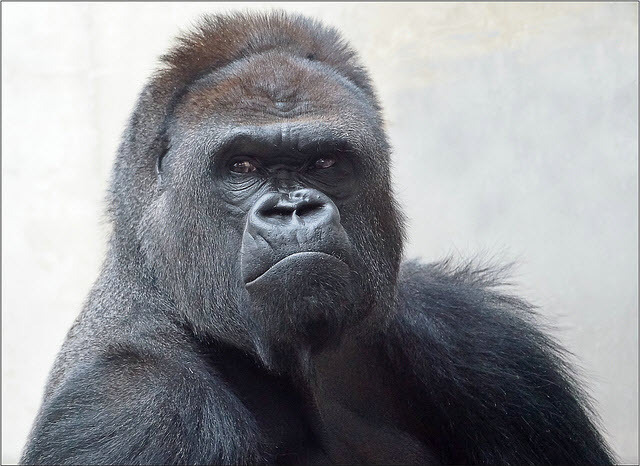 Basically they are the “the 800 pound gorillas” of the financial jungle. Obviously, the large banks see huge flows of foreign currency transactions from their daily operations. As a result, they’re able to achieve significant profit from just simply collecting the spread day, after day. However, the Bank is not limited by this day-to-day activity of making the market and collecting the spread. A dealer bank may also choose to take a position in the Fx market if it decides to do so, because it can see his order-book across the board. They can do this either, by making a trade with another member bank, or by quoting the currency accordingly in order to induce trades in a certain direction. Actually, bank dealers have to consider a number of factors before making their prices. 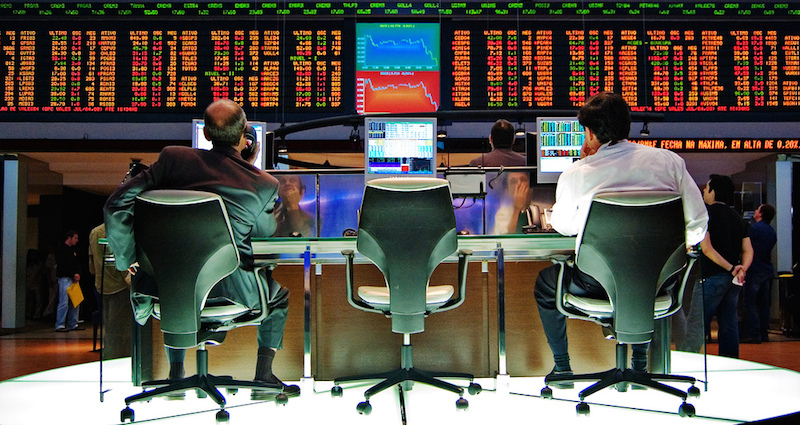 Obviously, there is a market-maker for each market: Stocks, Options, Bonds, Futures. So how these types of market-makers stack against each other. Let’s compare the two, Fx and Equities for example. Right from the start, Equities are being traded on the exchanges, where trade information is publicly available. This means, that the true price and volume are available for speculators in these markets. And this is a big plus, where the Fx dealings of large banks is considered a proprietary information, and on top of that there is no mandate for the info to be disclosed. The forex market maker is aware of large orders placed by financial Institutions before the rest of the participants. Hence, they are aware of the potential market-moving trades. Essentially, this gives them an unfair advantage over the other market groups. A number of of the Retail firms are often times referred to as market-makers, however, in reality they do not actually perform the root functions of a true Market Maker. Some Retail companies may operate successfully as a broker. Meaning, they hedge their risk immediately with their liquidity providers. Others may take some of the risk on to their own books. The key difference, they do not make their own prices as a true market maker. These Retail shops usually offer aggregated quotes for any particular pair. Simply put, they offer to their clients best bid/offer prices they have access to through the market making partners. These partners are the large banks from the Interbank level, who operate as prime brokers for these firms. The way the partners grant the access to their liquidity is through the ECN – Electronic Communications Network. An ECN software organizes bids and offers from larger banks, financial institutions and puts it into an order book. Now, when you place a trade, the ECN will match your order against the very best price available. The ECN networks are operating with lightning speed. The orders are matched in milliseconds and the spreads are usually very competitive. Also, there are STP – Straight Through Processing brokers as well. 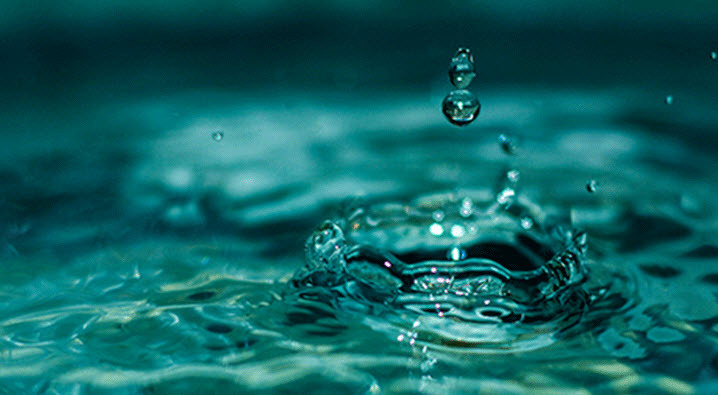 Despite the fact that ECN connects orders with those of other market participants as well as main liquidity providers, in the core they are very similar programs. The main difference, an ECN taps into a bigger pool of orders than a standard STP. On January 12th 2015, a financial tsunami ripped through the Fx Market, when the Swiss National Bank decided to unpeg its currency from the EURO. This caused Swiss Franc to appreciate against the EURO for more than 30% in a matter of minutes. Well, let’s put ourselves in the shoes of an STP Broker. 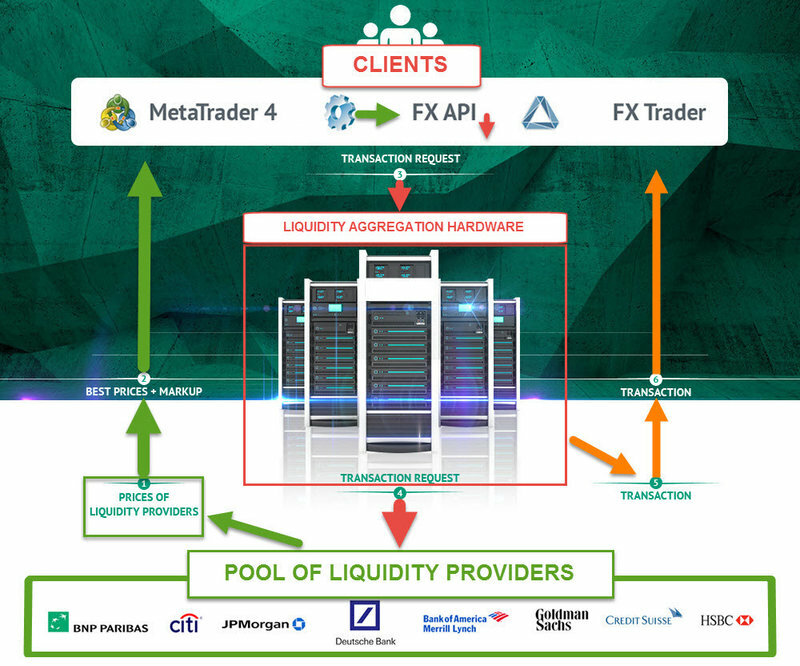 What would happen in case of a lack of liquidity is as follows: you would accumulate orders in a matter of seconds, then as a Straight Through Processor you would want to transfer those orders to your liquidity partner, but guess what?! There was nobody on the other side to pass on to…there was no Market Maker to fill your orders. I mean, there was, but the first bids on EUR/CHF pair were in the 0.8700-0.8800 area. 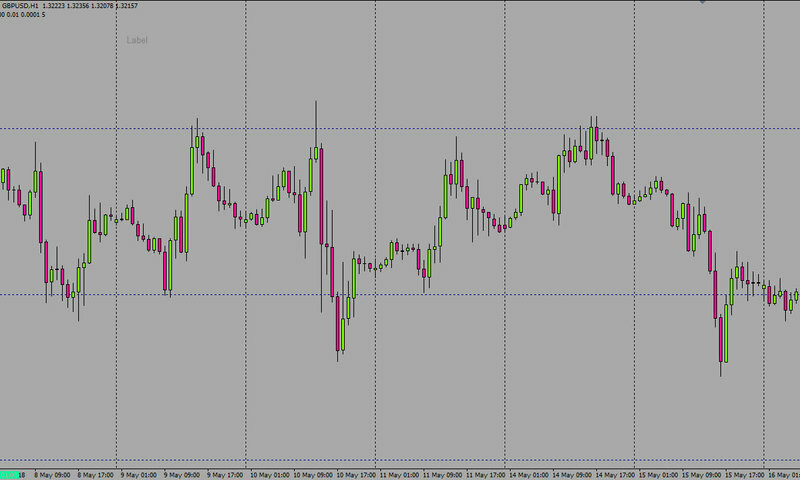 And that is more than 3200 pips lower from where it fell. In other words, there were plenty of Market Makers ready to make the market, they just happen to be 3200 pips below. Lots of so called true ECN and STP brokerage houses went under on that day. The losses that they had on their books were gigantic. Market Maker and the Boogeyman, what they have in common? Lots of traders simply just hate the Market Makers. They give them super-natural abilities of a Boogeyman. They blame them for their losses and for any unfortunate event that’s happening in their trading. However, let’s not forget, without the market-makers there would be no trading in the first place. The bottom line is that they are the most important component of the marketplace. Think about it for a second, they offer liquidity to the market by taking the opposite side of your trades. They are committed to satisfy any size of the deal. On top of that, they provide effective market quotes to the participants. And yes, the market-makers are not going to quote a price that doesn’t suit their own position, nevertheless they do quote a two-way price. A true market-maker is there to make a market, without it we as speculators wouldn’t be able to trade. A true market-maker’s commitment to sell and buy the currencies forms a cornerstone of all the pricing in the Forex marketplace. Despite heaving the huge volumes that go through the Interbank market, a large portion of Retail Forex participants simply do not have direct access to the liquidity. They use an ECN and STP Brokers, which in the cases of a “Black Swan” events prove to be vulnerable to the liquidity crunch. The gap between an Institutional investor and a Retail trader has narrowed over the past decade. Now, the retail speculators have access to competitive spreads, the overall trading became less stressful and very convenient.